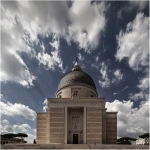 The Basilica of St. Mary of the Altar of Heaven is a titular basilica located on the highest summit of the Campidoglio. It is still the designated Church of the city council of Rome, which uses the ancient title of Senatus Populusque Romanus. 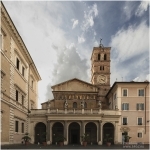 Originally the church was named Santa Maria in Capitolio, since it was sited on the Capitoline Hill of Ancient Rome, by the 14th century it had been renamed. 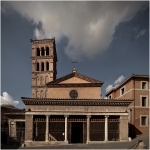 A medieval legend included claimed that the church was built over an Augustan Ara primogeniti Dei, in the place where the Tiburtine Sibyl prophesied to Augustus the coming of the Christ. A later legend substituted an apparition of the Virgin Mary. Santi Nereo e Achilleo is a fourth-century basilica church in Rome located in the rione Celio facing the main entrance to the Baths of Caracalla. His name is due to Saints Nereus and Achilleus, two soldiers and martyrs of the 4th century. the history tells to have been built in the place where St. Peter lost the foot bandage (fasciola) that wrapped the wounds caused by his chains, on his way to escape the Mamertine Prison. The church degradated with the time, and in 1320, according to the Catalogue of Turin, it was a presbyterial title with no priest serving. 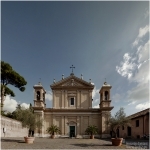 San Giorgio al Velabro, Roma. The church is located in the ancient Roman Velabrum, near the Arch of Janus. The ancient Arcus Argentariorum is attached to the side of the church's façade. The current basilica was built during the 7th century, possibly by Pope Leo II, who dedicated it to Saint Sebastian. The basilica was inside the Greek quarter of Rome, where Greek-speaking merchants, civil and military officers and monks of the Byzantine Empire lived. The building as we see it today is largely a product of the 1920s restoration. However, five years' further restoration followed the explosion of a car bomb, parked close to the Basilica's facade, at midnight on 27 July 1993. 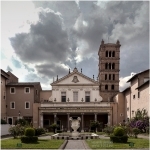 The inscription on the episcopal throne states that it is the first church dedicated to Mary, mother of Jesus, although some claim that privilege belongs to the Basilica di Santa Maria Maggiore. 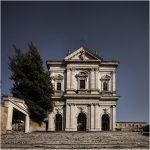 It is certainly one of the oldest churches in the city or Rome. 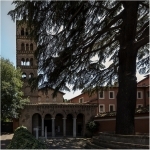 The Romanesque campanile is from the 12th century, near the top, a niche protects a mosaic of the Madonna and Child. The mosaics on the facade are probably from the 12th century. They depict the Madonna enthroned and suckling the Child, flanked by ten women holding lamps. This image on the facade showing Mary nursing Jesus is an early example of a popular late medieval and renaissance type of image of the Virgin. The façade of the church was restored by Carlo Fontana in 1702. The first church on this site was founded probably in the 3rd century, by Pope Urban I; it was devoted to the Roman martyr Cecilia, martyred it is said under Marcus Aurelius Severus Alexander, by the late fifth century, for in the synod of 499 of Pope Symmachus, the church is indicated with the Titulus Ceciliae. Tradition holds that the church was built over the house of the saint. The baptistery associated with this church, together with the remains of a Roman house of the early Empire, was found during some excavations under the Chapel of the Relics. 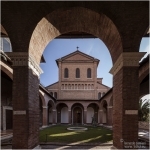 The church was built in the 8th century during the Byzantine Papacy over the remains of the Templum Herculis Pompeiani in the Forum Boarium and of the Statio annonae, one of the food distribution centres of ancient Rome. In 7th century this church was called de Schola Graeca. Because of its beauty, the church received the adjective cosmedin (from Greek kosmidion), ornate. A substantial restoration was accomplished in 1118–1124. 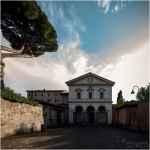 "Saint John Before the Latin Gate" is a Basilica church near the Porta Latina of the Aurelian Wall. History tells that in year 92, St John the Evangelist survived martyrdom at Rome under the Emperor Domitian by being immersed in a vat of boiling oil, from which he emerged unharmed. This event was traditionally said to have occurred at the Latin Gate. The tradition for the building of the Basilica places its construction during the pontificate of Pope Gelasius I (492-496). 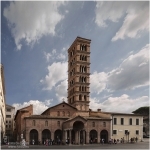 In the 8th century, the Basilica was restored by Pope Adrian I, and later the bell-tower and portico were added. 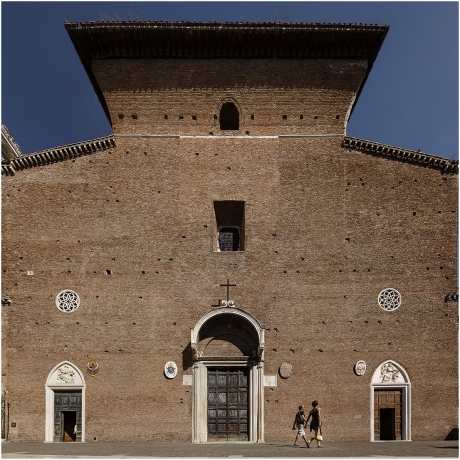 The main entrance to the Basilica is fronted by a small piazza with a 100-year-old cedar and an 8th-century well-head, nearly reproducing this aspect of the Basilica that would have been seen at the reconsecration of Pope Celestine III in the 12th Century. The chiesa di Sant’Anselmo all’Aventino is located in the Cavalieri di Malta square, in the rione Ripa. The attached abbey is called Badia Primaziale (Primatial Abbey) of the order of Saint Benedict since it is the residence of the order's senior abbot, the Abbot Primate and also hosts an Athenaeum, including the Pontifical Liturgical Institute, and the Philosophy and Theology faculties. The church is more modern than it looks: it was built by Francesco Vespignani between 1892 and 1896 and shows a neo-romanic style. The church is built on the ruins of an ancient Roman domus of the 2nd-3rd century A.D., still preserved under the church. 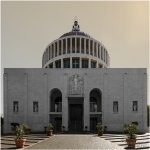 It was built by architect Pier Luigi Maruffi, between 1952 and 1955, at the suggestion of the then deputy to the Secretary of State of the Holy See Giovanni Battista Montini, the future Pope Paul VI, and with the help of the predominant American benefactors Thomas and Irene Bradley. The church received the pastoral visit of two Popes: Paul VI February 19, 1967, and Pope John Paul II February 23, 1982. 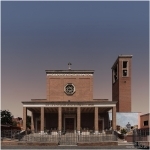 It is home to the titular church of "San Filippo Neri in Eurosia", established by Pope Paul VI June 7, 1967. Santa Anastasia was built in the late 3rd century - early 4th century, possibly by a Roman woman named Anastasia. The church is listed under the titulus Anastasiae in the acts of the 499 synod. Later the church was entitled to the martyr with the same name, Anastasia of Sirmium. The church was restored several times: Pope Damasus I (366-383), Pope Hilarius (461-468), Pope John VII (705-707), Pope Leo III (795-816), and Pope Gregory IV (827-844). The current church dates back to the 17th century restoration commissioned by Pope Urban VII. Traditionally, the church is connected to the cult of St Jerome, who possibly celebrated mass here. The saint is depicted over the altar, by Domenichino. San Gregorio Magno al Celio, is a church in Rome, Italy, which is part of a monastery of monks of the Camaldolese branch of the Benedictine Order. 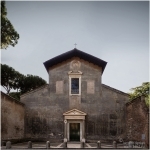 The church had its beginning as a simple oratory added to a family villa suburbana of Pope Gregory I, who converted the villa into a monastery, approximately 575-80, before his election as pope (590). The façade is the most prominent and artistically successful work of Giovanni Battista Soria (1629–33). It is located on the Caelian Hill, in front of the Palatine. Next to the basilica and monastery is a convent of nuns and a homeless shelter run by the order Blessed Mother Teresa of Calcutta. Basilica dei Santi Pietro e Paolo, Roma. The Basilica of Saints Peter and Paul is a church in Rome's EUR. It stands on the highest point of the district, at the point where it is believed arose an oratory of the Archconfraternity of the Pilgrims, devoted to the two apostles. The project was approved in September 1938 and work commenced in April 1939. The World War II slowed the work until be suspended after a bombing that affected the structures in 1943. Opened for worship in July 1955 In June of 1966 the church was consecrated by Cardinal Seper and the following year elevated to the status of Basilica. Built in the early fifties of the twentieth century by the famous Sicilian architect Gaetano Rapisardi. Its dome, as diameter size, is the second among the churches of Rome after St. Peter's Basilica one at the Vatican. On the façade is inserted a high relief, artwork of Arturo Dazzi, depicting the Apotheosis of St. John Bosco. The relief is accompanied by six marble statues depicting the archangels Michael and Gabriel, the Saints Francis de Sales and Joseph Cafasso and the Popes Pius IX and Pius XI. On the façade is included the porch, with five bronze doors, of which the central and principal, is 10 meters high.